Thursday, January 24 at 5:00pm | The Italian Research Seminar: “German Presences: Elena Ferrante’s Neapolitan Quartet and the Question of Authorship” by Prof. Alessia Ricciardi (Northwestern University). Friday, January 25 at 1:30pm |Panel Presentations in honor of International Holocaust Remembrance Day, featuring William Collins Donahue (Director of the Nanovic Institute for European Studies), Judy Shroyer (the Jewish Federation), and Kevin Cawley (University of Notre Dame Archives). After the panel discussion, all attendees are invited to the Scholars Lounge for a reception. Sponsored by: The Nanovic Institute for European Studies, Cushwa Center for the Study of American Catholicism, the Jewish Federation, and Hesburgh Libraries. Thursday, January 31 at 3:00pm | Exhibit Lecture: The Saint Dominic’s Press 1916-1936 by curator Dennis Doordan (Emeritus Professor, Notre Dame School of Architecture). The spring exhibit, As Printers Printed Long Ago: The Saint Dominic’s Press 1916-1936, curated by Dennis Doordan (Emeritus Professor, Notre Dame School of Architecture), opens in January and runs through the summer. The exhibition features different types of publications and posters produced by Saint Dominic’s Press, setting the story of the press within the larger history of the private press movement in England and examining its artistic as well as literary achievements. 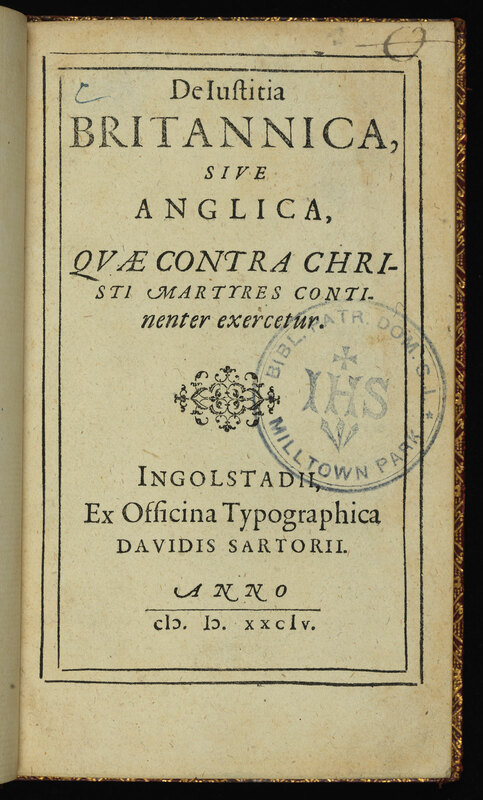 Hesburgh Libraries has recently acquired an interesting work from the Reformation period, De iustitia Britannica, siue Anglica, quae contra Christi martyres continenter exercetur (Ingolstadii, 1584). 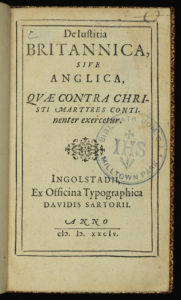 This title has been variously attributed to Cardinal William Allen, Robert Parsons and Nicholas Sander, but seems to actually be the work of an unidentified author who explicitly states that it is intended as a supplement to Allen’s A briefe historie of the martyrdom of xii priests (Rheims, 1582). 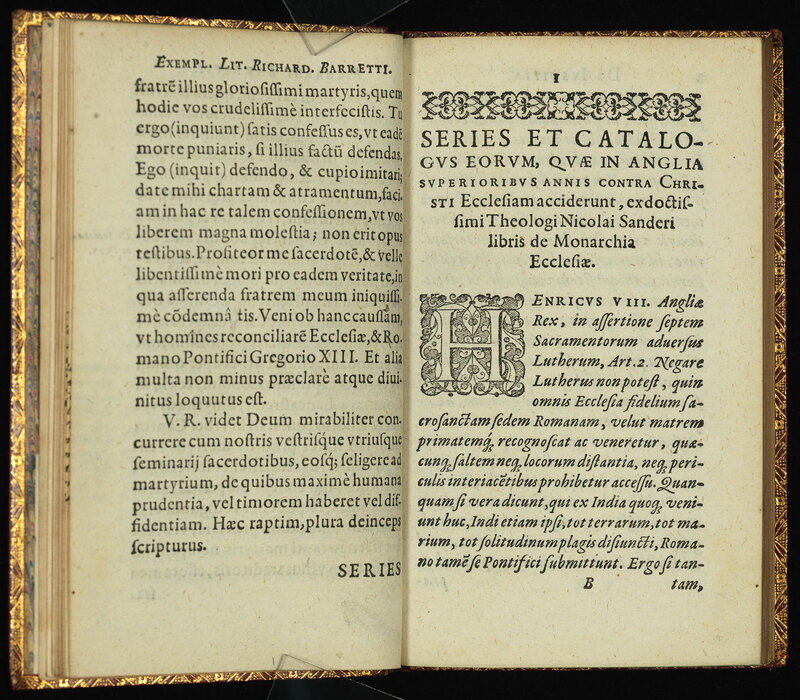 The title clearly references—and is a response to—Iustitia Britannica (Londini,1584), the Latin translation of William Cecil Burghley’s The execution of justice in England, which defended the execution of Edmund Campion and other Catholics in 1581. 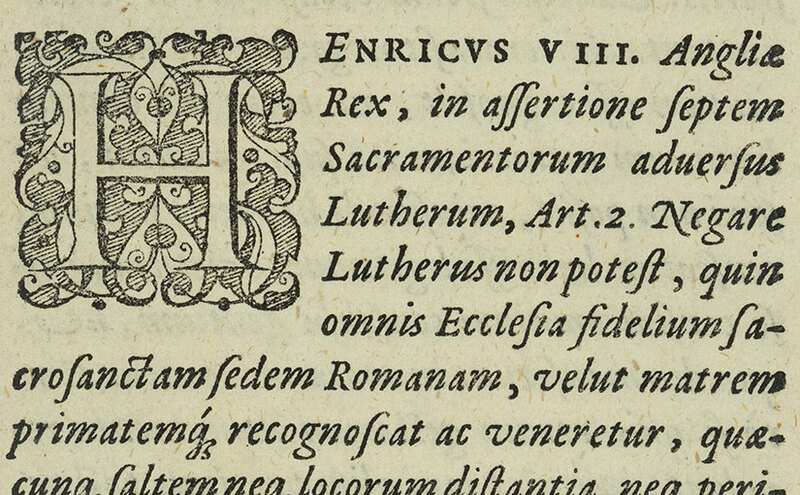 This acquisition is the first and only edition of the work; we have identified only six other North American holdings. At the outbreak of the First World War, there were approximately 10,000 British nationals within the borders of the German Reich. Some were on holiday while others had resided in the country their entire lives or were passing through as sailors aboard merchant vessels. Regardless of background, their British citizenship marked them for suspicion in the eyes of the German government as well as retaliation for the plight of German nationals in Great Britain. Therefore, it was determined that male British nationals of military age were to be arrested and interned for the duration of the war (though with the possibility for freedom through prisoner exchanges). While various camps were hastily constructed to house these detainees, Ruhleben was the only camp that was entirely populated by civilian prisoners. Constructed on the grounds of a horse racing track on the outskirts of Berlin, Ruhleben would house over 4,000 prisoners at its height. Inmates were barracked in repurposed stables in extremely poor condition due to the inadequate facilities. Over time and with the intervention of the American ambassador, Ruhleben would grow to include not only upgraded barracks and latrines, but also a library, school, stores, and post office. Lack of privacy was a perpetual concern for the men while at the same time they were virtually cut off from the rest of civilization apart from Red Cross parcels and short letters from home. As a result the camp formed its own community complete with newspaper, theater productions, sports teams, and various clubs to keep boredom at bay. Printed version above (MSE/MD 3829-3B) and scrapbook version below (MSE/MD 3829-1B) of a dual advertisement. 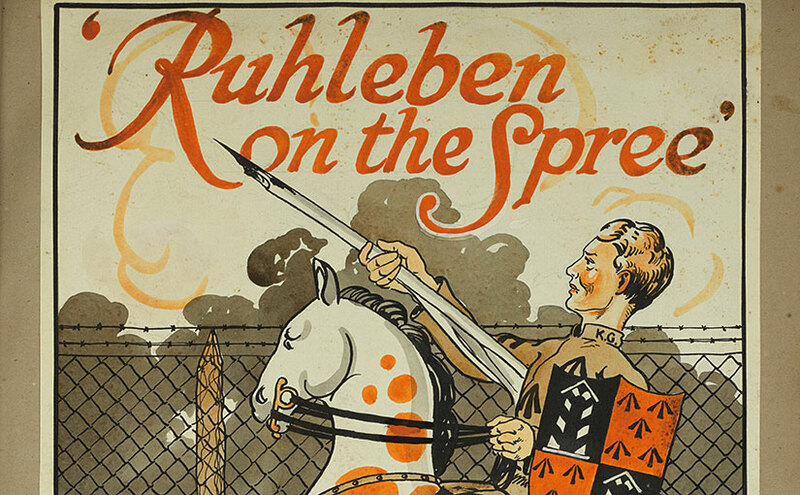 One such endeavor was In Ruhleben Camp and its successor The Ruhleben Camp Magazine. 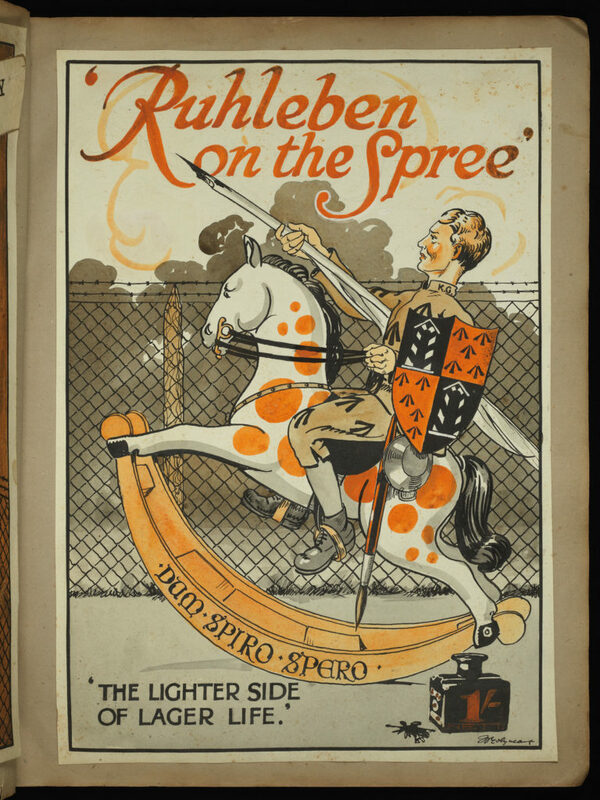 Special Collections recently acquired a full set of these issues in two bound volumes accompanied by a bound, two-volume scrapbook containing original drawings from the magazine. Published fortnightly, the magazine included stories and cartoons parodying camp life as well as reports of camp activities such as reviews of musicals, sports recaps, and advertisements for lectures. A marked tone of humor is prevalent throughout, in keeping with the unofficial camp slogan “Are we downhearted? 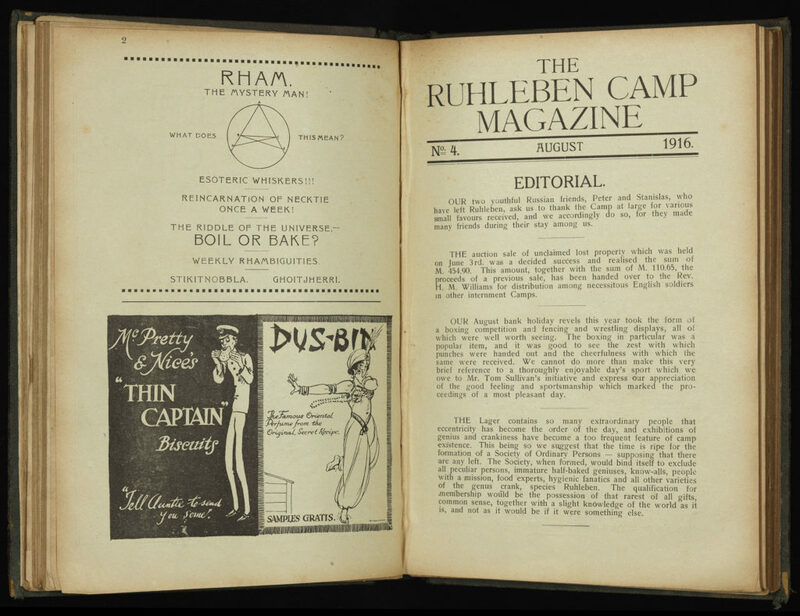 No!” An in-depth chronicle of camp life, the magazine represents some of the best documentation of the Ruhleben experience. The highlight of this collection is the two-volume scrapbook. Bound in pasteboard and measuring 16.5″ x 12.75,” the scrapbook contains 53 original drawings in pen-and-ink, watercolor, and graphite. 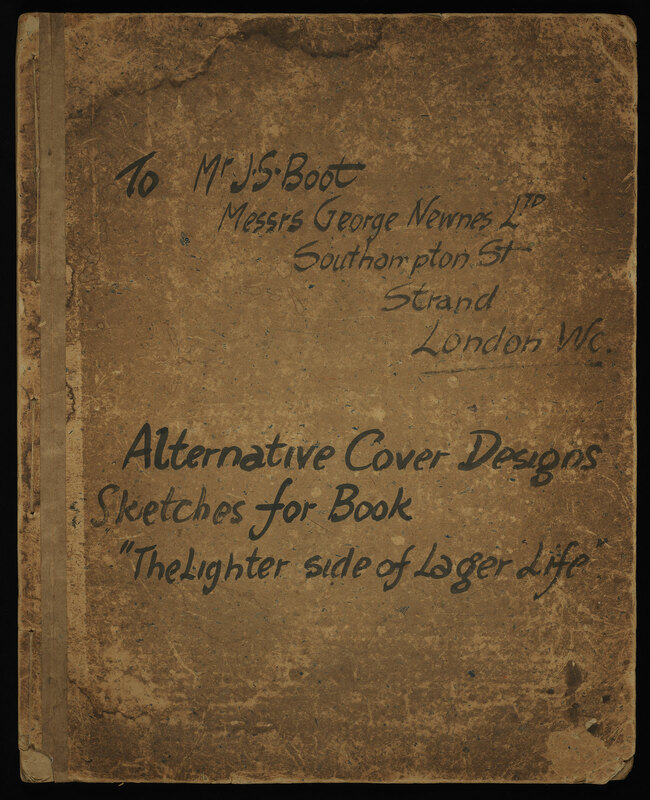 Although the purpose of the scrapbook is not certain, material on the front cover indicates that the scrapbook was a mock-up for a London publisher, George Newnes Ltd., to use for the publication of a book to be called, “The Lighter Side of Lager Life.” Who compiled the scrapbook is also unknown, but it may have been one of the magazine’s editors, Louis Egerton Filmore or C. G. Pemberton. 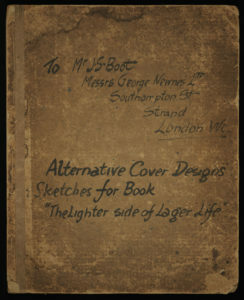 The scrapbook volumes include original illustration, many of which did not appear in the printed magazines. 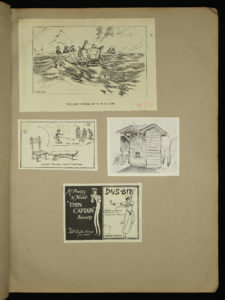 The drawings depict camp life in a vivid display of the camp’s signature humor. 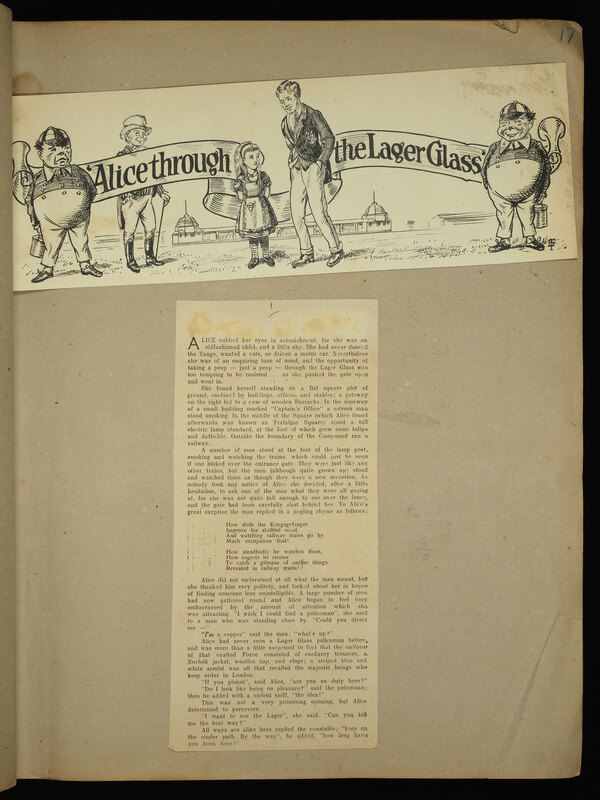 Original artwork is paired with clippings that parody classic British texts such as “Alice Through the Lager Glass” and Shakespeare rewritings. 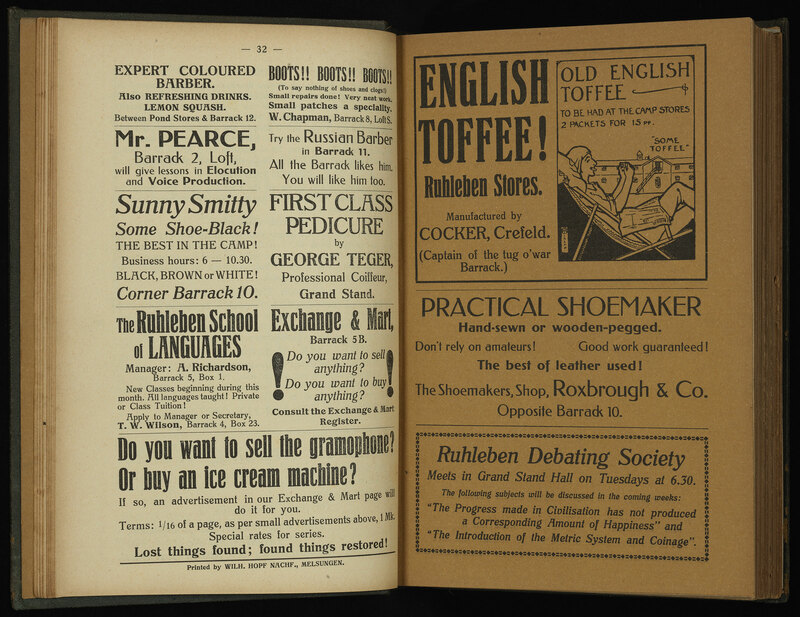 These parodies were some of the most popular types of entries in the printed magazine. Other literary pieces included poetry known as “Ruhlimericks” which poked fun at camp conditions and life or humorous advertisements for various services.